A lovely baptism gift basket, trimmed in hues of silver and gold, includes a stunning keepsake frame and a host of delicious sweets. 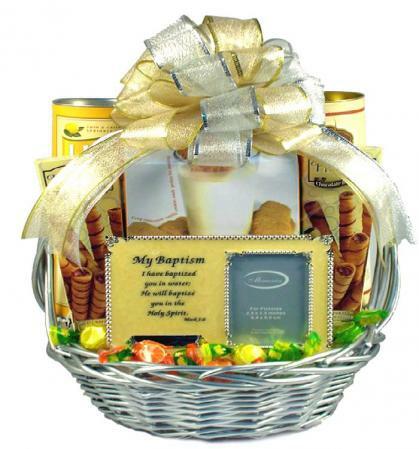 Help them celebrate this special time in their life with this precious and beautiful Baptism gift basket. Arranged hues of silver and gold, this elegant gift features a stunning keepsake picture frame to commemorate the special occasion, alongside a host of delicious sweets to help the family celebrate it!